Download "Low back pain. Quick reference guide. Issue date: May 2009. 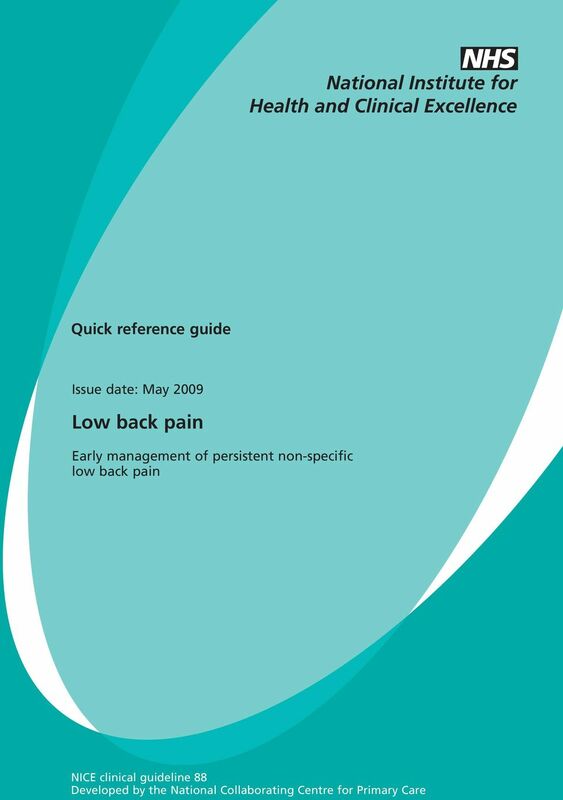 Early management of persistent non-specific low back pain"
2 About this booklet This is a quick reference guide that summarises the recommendations NICE has made to the NHS in Low back pain: early management of persistent non-specific low back pain (NICE clinical guideline 88). Who should read this booklet? 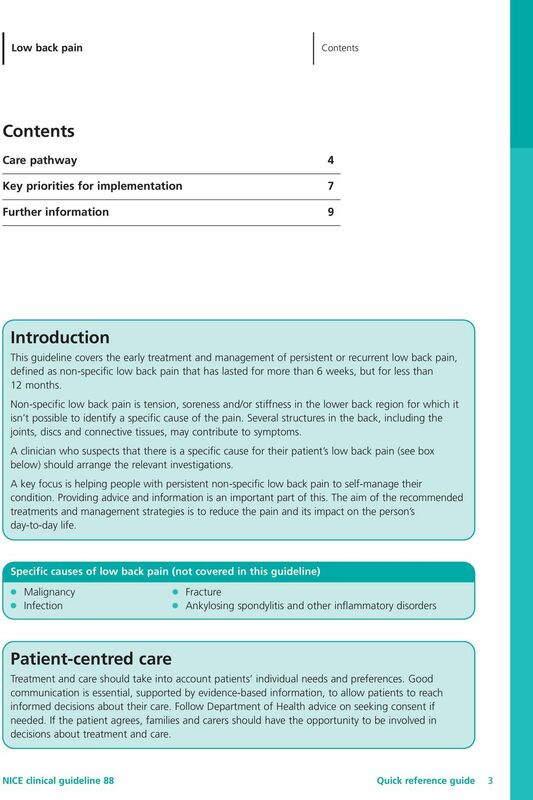 This quick reference guide is for healthcare professionals and other staff who care for people with low back pain. Who wrote the guideline? 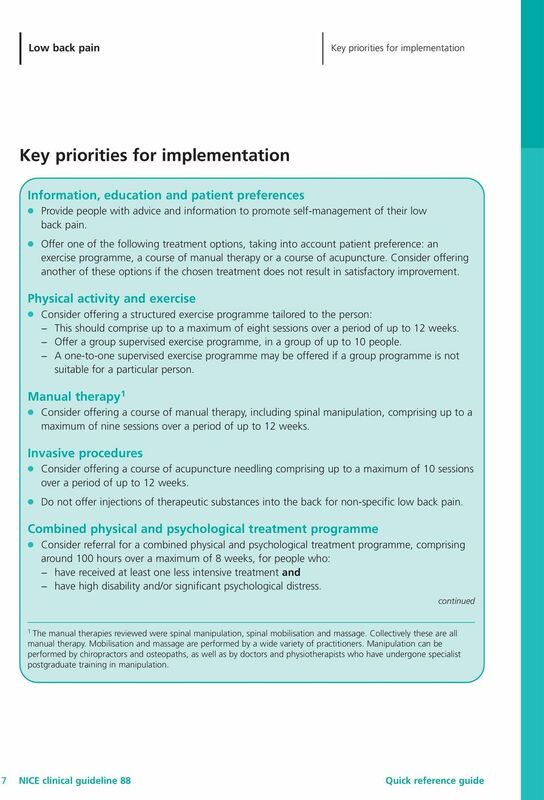 The guideline was developed by the National Collaborating Centre for Primary Care. The Collaborating Centre worked with a group of healthcare professionals (including consultants, GPs, nurses and allied professionals), patients and carers, and technical staff, who reviewed the evidence and drafted the recommendations. The recommendations were finalised after public consultation. For more information on how NICE clinical guidelines are developed, go to Where can I get more information about the guideline? 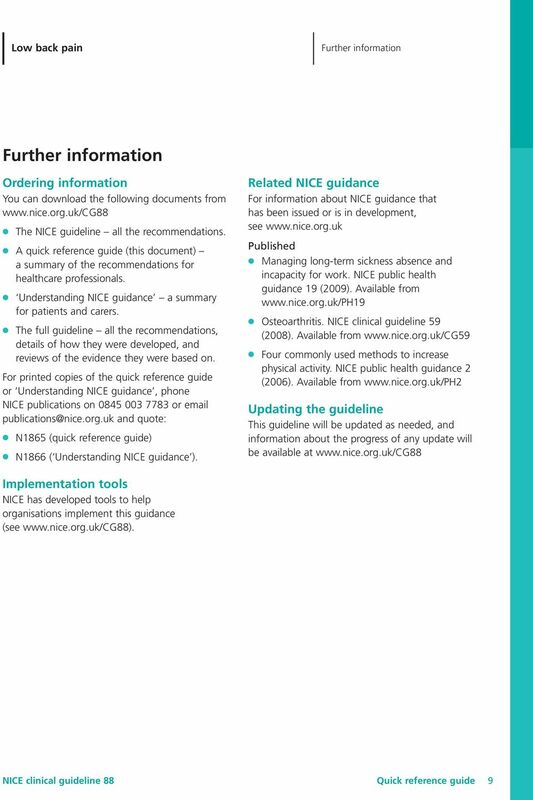 The NICE website has the recommendations in full, reviews of the evidence they are based on, a summary of the guideline for patients and carers, and tools to support implementation (see page 9 for more details). 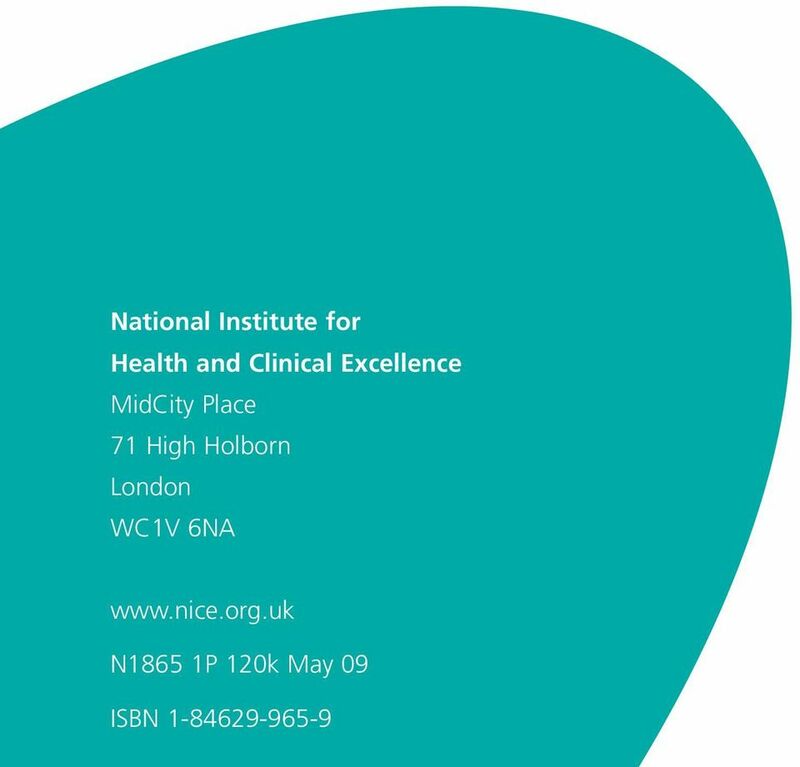 National Institute for Health and Clinical Excellence MidCity Place 71 High Holborn London WC1V 6NA ISBN National Institute for Health and Clinical Excellence, All rights reserved. This material may be freely reproduced for educational and not-for-profit purposes. No reproduction by or for commercial organisations, or for commercial purposes, is allowed without the express written permission of NICE. NICE clinical guidelines are recommendations about the treatment and care of people with specific diseases and conditions in the NHS in England and Wales. This guidance represents the view of NICE, which was arrived at after careful consideration of the evidence available. Healthcare professionals are expected to take it fully into account when exercising their clinical judgement. 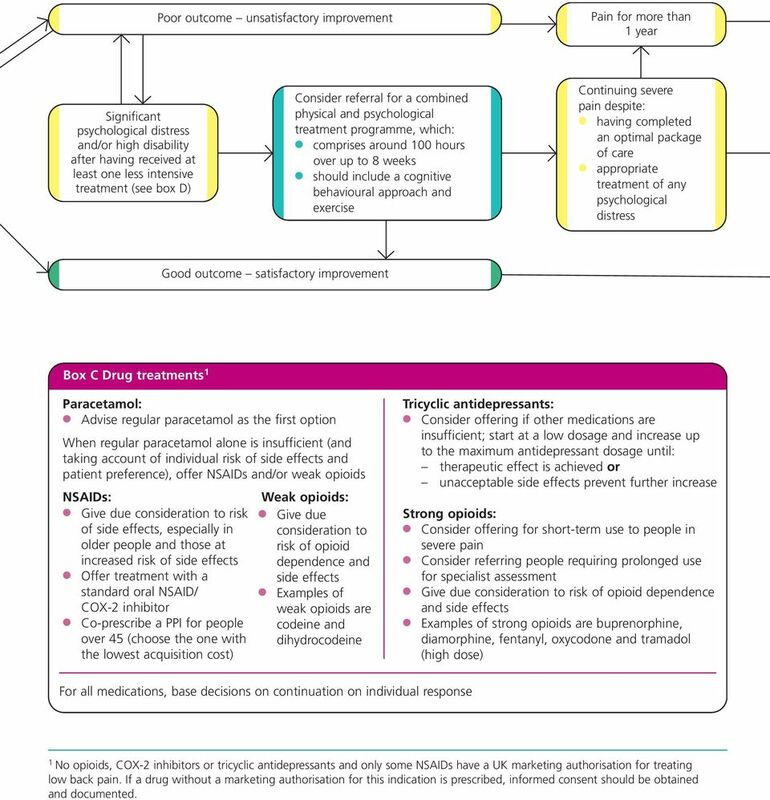 However, the guidance does not override the individual responsibility of healthcare professionals to make decisions appropriate to the circumstances of the individual patient, in consultation with the patient and/or guardian or carer, and informed by the summary of product characteristics of any drugs they are considering. Implementation of this guidance is the responsibility of local commissioners and/or providers. Commissioners and providers are reminded that it is their responsibility to implement the guidance, in their local context, in light of their duties to avoid unlawful discrimination and to have regard to promoting equality of opportunity. Nothing in this guidance should be interpreted in a way that would be inconsistent with compliance with those duties. 5 Poor outcome unsatisfactory improvement Pain for more than 1 year Significant psychological distress and/or high disability after having received at least one less intensive treatment (see box D) Consider referral for a combined physical and psychological treatment programme, which: comprises around 100 hours over up to 8 weeks should include a cognitive behavioural approach and exercise Continuing severe pain despite: having completed an optimal package of care appropriate treatment of any psychological distress Good outcome satisfactory improvement Box C Drug treatments 1 Paracetamol: Advise regular paracetamol as the first option When regular paracetamol alone is insufficient (and taking account of individual risk of side effects and patient preference), offer NSAIDs and/or weak opioids NSAIDs: Give due consideration to risk of side effects, especially in older people and those at increased risk of side effects Offer treatment with a standard oral NSAID/ COX-2 inhibitor Co-prescribe a PPI for people over 45 (choose the one with the lowest acquisition cost) Weak opioids: Give due consideration to risk of opioid dependence and side effects Examples of weak opioids are codeine and dihydrocodeine Tricyclic antidepressants: Consider offering if other medications are insufficient; start at a low dosage and increase up to the maximum antidepressant dosage until: therapeutic effect is achieved or unacceptable side effects prevent further increase Strong opioids: Consider offering for short-term use to people in severe pain Consider referring people requiring prolonged use for specialist assessment Give due consideration to risk of opioid dependence and side effects Examples of strong opioids are buprenorphine, diamorphine, fentanyl, oxycodone and tramadol (high dose) For all medications, base decisions on continuation on individual response 1 No opioids, COX-2 inhibitors or tricyclic antidepressants and only some NSAIDs have a UK marketing authorisation for treating low back pain. If a drug without a marketing authorisation for this indication is prescribed, informed consent should be obtained and documented. Low back pain. 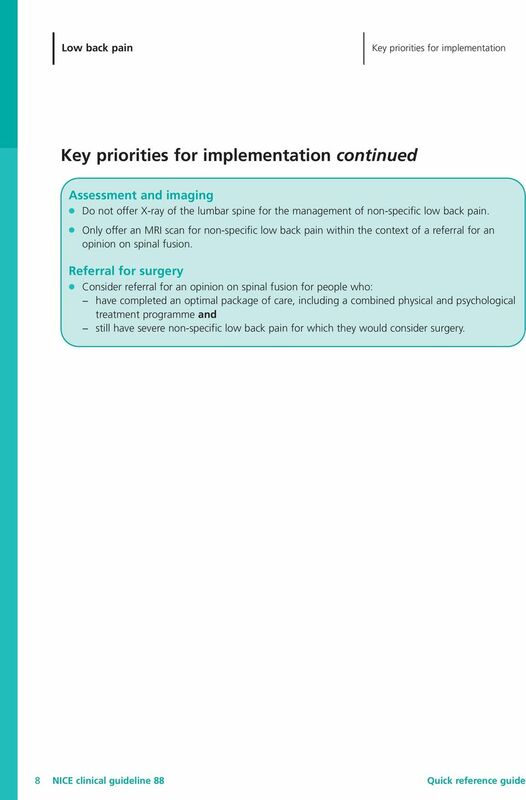 Early management of persistent non-specific low back pain. Issued: May 2009. 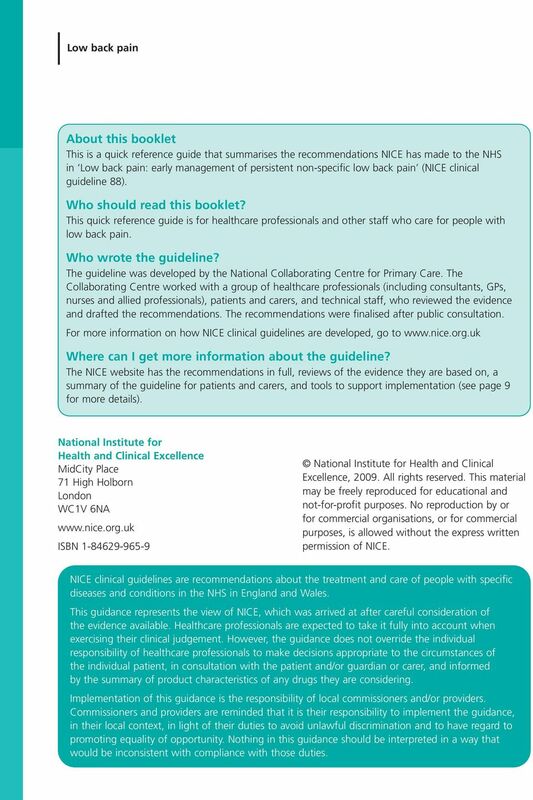 NICE clinical guideline 88. guidance.nice.org. NHS. Surgical repair of vaginal wall prolapse using mesh. National Institute for Health and Clinical Excellence. 1 Guidance. 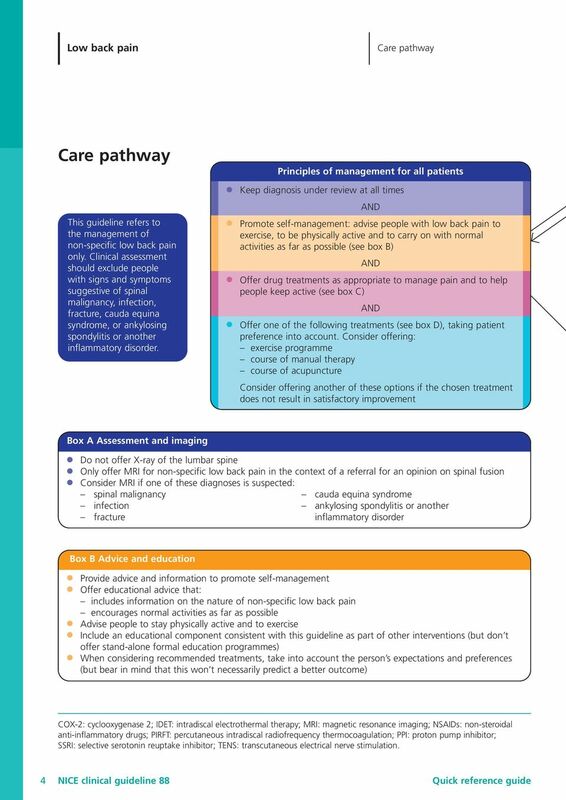 Rehabilitation during the patient s critical care stay bring together all NICE guidance, quality standards and other NICE information on a specific topic. are interactive and designed to be used online. Is manual physical therapy more effective than other physical therapy approaches in reducing pain and disability in adults post whiplash injury? Organising and planning services for people with a personality disorder A NICE pathway brings together all NICE guidance, quality standards and materials to support implementation on a specific topic area. 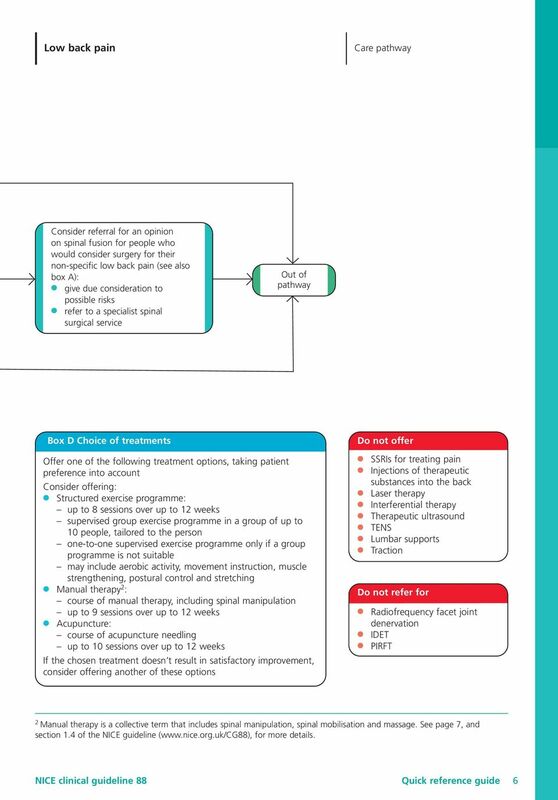 Rehabilitation for movement difficulties after stroke bring together all NICE guidance, quality standards and other NICE information on a specific topic. are interactive and designed to be used online. Date: 06/06/2014 Our ref: 4496. I write in response to your request for information in relation to treatment for endometrial cancer in NHS Lothian.